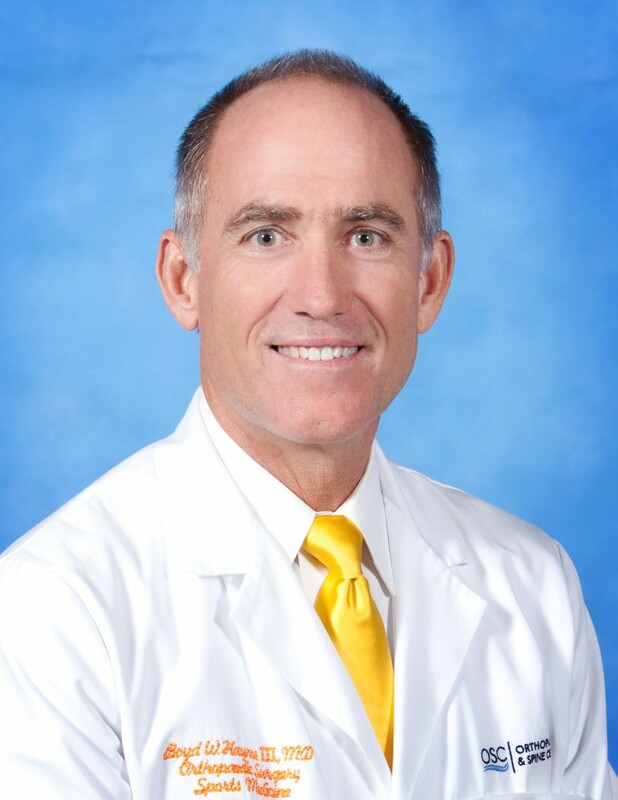 Dr. Boyd Haynes is a Sports Medicine fellowship-trained orthopaedic surgeon who has been with OSC since 1992. His practice is focused on sports-related injuries and disorders, with a special emphasis on hips, knees and shoulders. A pioneer in the field of Outpatient Total Joint Replacement, Dr. Haynes also performs computer-navigated Direct Anterior Hip Replacements, as well as the Makoplasty partial knee replacements. He is also the only Orthopaedic Surgeon on the Peninsula that performs endoscopic carpal tunnel release and endoscopic cubital tunnel release surgery. He also specializes in arthroscopic knee reconstruction and arthroscopic shoulder surgery. Dr. Haynes is the Medical Director of the Peninsula Surgery Center in Newport News, VA. He performed the first outpatient total knee replacement in July, 2010. The patient, 52 years of age, went home the same day as her surgery, after spending less than 10 hours in the hospital. Dr. Haynes continues to focus on minimally-invasive surgical options for our patients. Dr. Haynes is a repeat honoree as a “Top Doc” in our community, as selected by other physicians throughout the area. He has received many other honors and award during his career. Dr. Haynes is a Richmond, Virginia, native, but has lived and worked on the Peninsula for over 20 years. He enjoys mentoring students who are interested in or pursuing a career in medicine. Dr. Haynes also enjoys playing volleyball, boating, fishing and spending family time with his wife and 3 kids. Contact OSC today to set up an appointment with Dr. Boyd Haynes or one of our other orthopedic specialists.